… As you find your seat and wait for Berkeley Repertory Theatre’s production of The Life of Galileo to begin, you’re sure to be caught off guard. Brooding, ethereal electronic music seeps through the house, broken every few minutes by a burst of startling, dissonant noise. The walls are covered with sheets of corrugated tin, suggesting an industrial warehouse. The weird disjunction between the post- modern setting and the play’s text – the company follows playwright Bertolt Brecht in grounding the material very precisely in its era – opens disquieting questions that reverberate throughout this triumphant production. 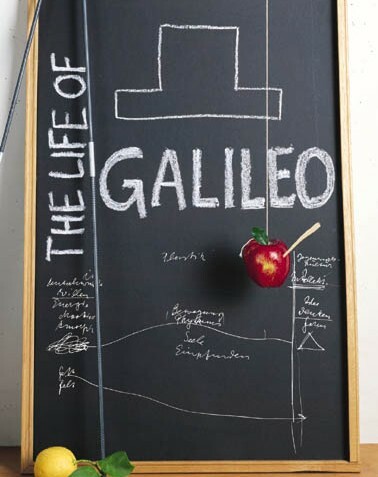 The Life of Galileo is among Brecht’s most complex plays. It consistently refuses easy resolutions to the thorny problems it tackles. Whereas Amadeus remains content with its simplistic struggles between genius and talent, good and evil (making Mozart a sensualist and a buffoon is hardly a complication in a play this schematic), Brecht goes much further. Galileo behaves atrociously, stealing credit for other’s discoveries, putting his family and friends into grave peril, destroying his inquisitive daughter’s spirit, and ultimately recanting in the face of the Inquisition. These actions are never explained away, never justified in the name of the greater good. They are simply presented as the terrible things a great man did to survive in difficult times. Better yet, Brecht allows the opposition- the Church and the scientists who refuse to abandon Aristotelian astronomy – real eloquence in their refutations of Galileo. He never sets up straw men to destroy. When the little monk defends the Church’s paternalism, it’s from passionate conviction and lived experience. His eventual conversion to Galileo’s side comes after real struggle; we see how deeply he believes in all that he must reject. Berkeley Rep’s production works from David Hare’s new translation. It is by far the best English version yet, capturing Brecht’s spiky humor and avoiding the flat-footed, prosaic literalism of previous attempts. Hare is at his best in the early teaching scenes. There’s real exhilaration in Galileo’s explanations of Copernicus, an understanding of how joyful learning can be. The wit and precision of these moments is dazzling, a fact that never emerged in the better known Laughton and Sauerlander-Manheim translations. Michael Winters’ performance as Galileo is a constantly surprising delight. It’s a difficult role, one which requires great charisma (we must understand how this irascible, contradictory man gathers his acolytes), self-deprecating humor and an ability to communicate complex ideas with clarity and precision. Winters succeeds on all fronts. He would make a stunning Falstaff: his good humor and vitality shine through in every scene. His direct speeches to the audience (in his own voice, rather than Galileo’s, a Brechtian device that can be disastrous in the wrong hands) are flawless, serving to personalize the issues at hand by circumventing the drama in favor of discussion. The rest of the cast is excellent. Amy Mordecai, as Galileo’s daughter Virginia, gives the only problematic performance. Brecht conceives Virginia as a voice of complacency and reaction, the nagging specter of the Church in Galileo’s home. This is not only historically inaccurate (Virginia was no one’s doormat), it also courts misogyny. Director Mark Wing-Davey makes gestures towards acknowledging this (Galileo’s blunt refusals to bother explaining his discoveries to young Virginia are emphasized), but they remain undeveloped. Mordecai struggles with a thankless role, but can’t avoid sounding strident. The only other real misstep is the carnival scene. In the text, Brecht uses a street singer’s song to demonstrate that Galileo’s ideas were trickling down to the peasantry, distorted by the Church into assaults on God. Here, the street singers are replaced by a gang of children, screaming over what sounds like a Nine Inch Nails outtake. Not a word can be understood. The title projections that work so well throughout the rest of the play are simply confusing here. The scene will mystify anyone who doesn’t already know the play. Those few false notes aside, this is a magnificent production. The play continually deepens, complicating every issue (science versus the church gives way to a rumination on the role of the scientist in the market), and never settling for any easy position. Wing-Davey negotiates every turn expertly, shifting emphasis from scene to scene in a manner that’s even-handed and thoughtful. Questions are raised but never answered, and we’re left with the haunting sense that, five hundred years after the fact, all these struggles remain.